Cheryl Mesler likes it when customers come into her store with boxes of old books. “The used book part of the store is the most interesting because you never know what’s going to come in everyday,” she said. Cheryl and Corey Mesler are the married co-owners of Burke’s Books Store on 936 S. Cooper St., home to approximately 16,000 used books. At least five people a day come in to sell used books, Mesler said. January is a busy time because of spring-cleaning and the end of the semester because people are packing up and moving. Burke’s, which is 139 years old, houses books of varying genres including literary classics, religion and philosophy. Amanda Bearden, an employee at Burke’s for two years said she likes when she finds old science fiction books in the buyback program. “I just like books. I’m addicted to them and plus, I get first dibbs,” she said. Bearden said she advises anyone who is going to sell books to Burke’s to check the guidelines online. “It’s important and it saves time,” she said. The Meslers accept hard backs and trade paperbacks, which are the larger sized paperback books as opposed to the mass market ones, which are usually pocket-sized. They do not accept Readers Digest editions, ex-library editions, technical or computer books or book club editions. The books should be in good condition and brought into the store in either bags or boxes, preferably between 10 a.m. and 4 p.m. People who have a large amount that they want to sell should call ahead. When the books are finished being appraised, the seller will be made an offer for the books. They can either accept the amount in cash—a check will be made out if the amount is more than $20—or a store credit for 1.5 times the amount of the cash offer. Books brought into the store to be sold are researched and compared to online prices. Mesler said the Internet has changed the way people buy used books now because everyone can sell, which is why the buyback amount varies from book to book. The Burke’s inventory is online and the store is now part of the global market thanks to the Internet. Mesler said she is sometimes surprised by how much some books are worth compared to others. Family members brought in a collection of books that belonged to a man that died and had collected memorabilia from World War II. “There were 15 boxes of WWII books,” she said. While going through them she found a pamphlet in Japanese that were instructions for a fighter plane and worth $50. Another man came in one day with a dozen boxes filled with books all about poker. “I bought about half of what he brought in,” Mesler said. Recently, the Civil War section of the store has doubled. Currently, the Mesler’s are working on buying back college textbooks and hope to start in May. They will be looking for all types. 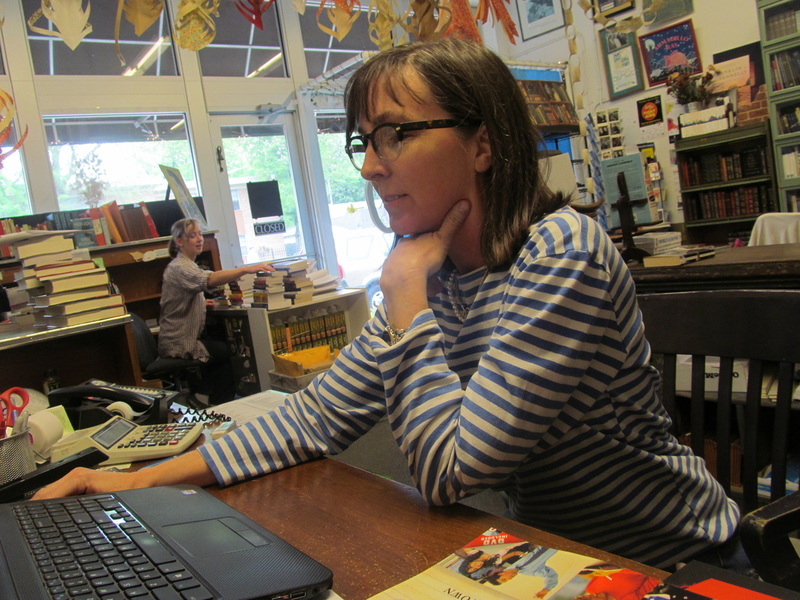 Cheryl Mesler and Amanda Bearden work the front desk of Burke’s Book Store, which is 139 years old.